Fuse Circus: Ignite your imagination! S winging, twisting, swooping – like a swing from your childhood dreams Aerial Hoop is like a suspended hula hoop where a performer can hang, twist, spin and sit in the hoop in a variety of poses and drops. Aerial Hoop is also known as "Circeau" and "Lyra". It is a circular steel apparatus that can be hung at a set height (static) or can be set up with a counterweight system, allowing the aerialist and hoop to be raised and lowered throughout their performance. Aerial Hoop performances are fun and can suit a romantic air, as the hoop provides a lovely frame for the performer. 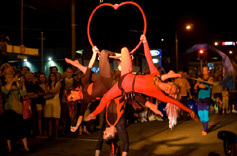 The aerial hoop can be used by one or two performers at once. Double aerial hoop performances are similar to doubles trapeze, where one aerialist is the base and holds the other performer, the flier, in a range of death defying drops and complicated poses. The flier and base use the whole hoop in the performance, creating a symmetrical duet of balletic movement. The Aerial hoop is a very good choice for installational performance as it allows the aerialist time to rest between strenuous routines, while still remaining in the air. Aerial Hoop is rigged on a single point, so needs only a load bearing beam, RSJ, fly bar, crane, to a safety factor of 1:10. We can also supply our own free-standing truss system. The working height can be anything from 4m or above. Contact Tom Beauchamp to arrange a booking for an aerial hoop act or for any inquiries. We specialise in coordinating acts and production requirements to deliver a fantastic event!